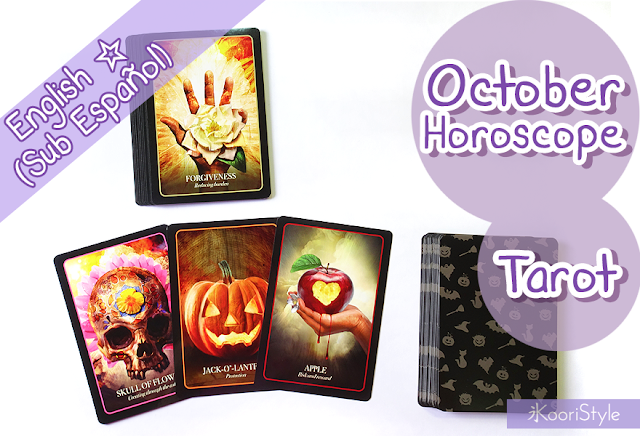 Hi Friends~ today I'd love to share with you my first tarot reading for ALL the horoscope signs ♥! This reading is for the month of October 2016 and I'll be using the Halloween Oracle deck. Here are the timestamps: 01:10 Capricorn, 01:59 Aquarius, 02:44 Pisces, 03:19 Aries, 04:15 Taurus, 05:03 Gemini, 05:55 Cancer, 06:55 Leo, 08:20 Virgo, 09:07 Libra, 10:13 Scorpio, 11:39 Sagittarius, 13:42 Ending. Did you like your advice? I wish you a happy month! See you soon my friends ♥! (You can check out more reading related videos on the playlist "HERE").